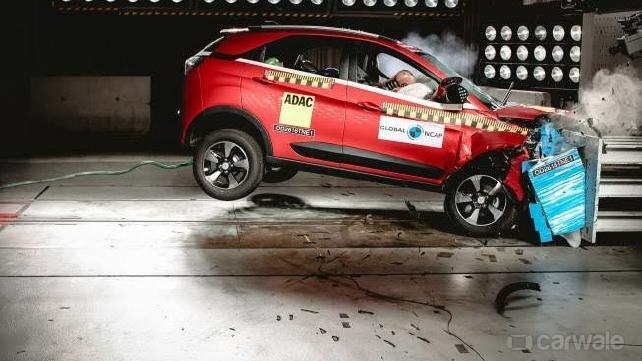 – The updated Tata Nexon scores five stars in the Global NCAP test. – It is the first made-in-India, sold-in-India car to achieve it. – The Nexon scored five stars for Adult and three stars for Child Occupant’s Protection. After scoring four stars earlier this year in the Global NCAP test, the Tata Nexon has now became the first Indian-built car to score the full five stars in the latest test round. The sub-4 metre SUV scored five stars for adult occupant protection and three stars for child occupant protection. After Nexon managed to score four stars in the earlier test, Tata improved the safety features by including seat belt reminder (SBR) as standard offering for both driver and passenger. This time around, the Nexon underwent a side impact test for compliance with UN95 side impact protection requirements. According to the latest NCAP test, the Nexon offers good protection for both adult head and neck, marginal protection for the driver chest and adequate protection for passenger chest. The pedals showed some risk for the lower legs due to their displacement. The 18 month old child dummy received good protection while the 3 year old child passenger showed high readings in chest and head exposure. Compared to the older test, the new Nexon scored 16.06 points out of the total 17 – as opposed to the 13.56 points before. The children protection values remain the same though. The new five star ratings are applicable to the Nexon model produced from 7 December 2018 onwards. The bodyshell integrity of the Nexon was regarded as “stable” too.